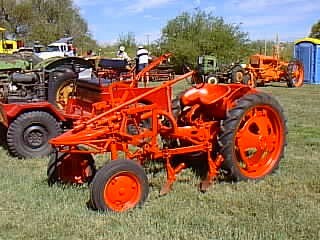 The first Allis-Chalmers Model G was produced in 1948 in Gasden, Alabama, and was designed for vegetable gardeners, small farms and landscape businesses. It is a small compact tractor that came with a complete line of implements especially tailored for its unique design. It featured a rear-mounted Continental N62 four-cylinder engine with a 2-3/8 x 3-1/2 inch bore and stroke. The rear-mounted engine provided traction for the rear wheels while at the same time gave the tractor operator a great view of the belly-mounted implements. Some of the many implements designed for this tractor were plows, planters, cultivators. In the early 1950's they even came out with a front-mounted windrower and a front-mounted hay rake. A very unique idea - however unless the wind was at the operator's back he was subjected to a choking cloud of dust and debris from these implements. Allis-Chalmers had high hopes and big plans for this little tractor, and produced it between 1948 and 1955. However, production fell far short of their expectations and less than 30,000 ended up being built. It was indeed very popular with small truck farmers but did not meet the needs of the grain farmer with it's inability to properly harvest the grains. We actually know people who are still using these for their truck gardens. A community-supported produce and farm store down the road from us can often be found with its Allis-Chalmers Model G cultivating a very large garden. From a distance it looks to some like a large orange spider and gets more than one curious glance. Most of them however can be found in the hands of collectors in most part due to their usefulness and unique construction. They are highly sought after and can command a high price. We have seen them sell from $2500 to as high as $10,000 depending upon restoration quality and the number of original implements. In 1955 (the last year of production) the tractor sold for approximately $970.00. Engine: Continental N-62, 2-3/8 x 3-1/2, 1800 rpm, 4-cylinders, L-head, cast en bloc. Piston displacement 62 cu. in. A Continental AN-62 four-cylinder, L-head engine powered the Allis-Chalmers G tractor. Rated at 1,800 rpm, it featured a 2-3/8 x 3-1/2 inch bore and stroke. Also featured was a Delco-Remy electrical system and a Marvel-Schebler TSV-13 carburetor. Forward speeds of 2.25, 3.5 and 7 mph were included, along with a "special low" of 1.6 mph. No repairs or adjustments were noted during 45 hours of engine operating time. Without additional weights, the Model G weighed in at 1,549 pounds. Test H was run in second gear - at a speed of 3.2 mph a pull of 851 pounds with a slippage of 7.8% wass recorded, along with an output of 7.26 drawbar horsepower and a fuel economy of 7.64 horsepower hours per gallon. A maximum low-gear pull of 1.143 pounds was noted in Test G. At a Test C operating maximum load of 10.07 belt horsepower, fuel economy was recorded at 9.06 horsepower hours per gallon. By comparison, fuel economy slipped very slightly to 8.74 under a Test D rated load of 9.37 belt horsepower. Tire equipment included 7-30 rear and 4.00-12 inch front rubber.